56 Auto Sales used car dealer is proud to serve London and all bordering London areas in Ohio with the best used cars for sale in the London area. Located at 781 State Route 56 SW, London OH 43140 our full-fledged customer service provides the best used car buying experience. 56 Auto Sales is conveniently located just outside of downtown London, Ohio. Our store is just a short drive from any London neighborhood. We have an extensive collection of used cars for sale that are perfect for your daily London commute, driving your kids around, or for a weekend getaway. Regardless of your lifestyle 56 Auto Sales London has the perfect vehicle for you. Make your move and come see us at our convenient London location. 56 Auto Sales takes pride in offering one of the finest used car lots in London. Our staff is here to please you and make your used car buying experience enjoyable with a casual and relaxed atmosphere. With choices for vehicles under $20,000, $10,000 and $5,000 will find the car you want that fits every budget. The car buying process does not have to be challenging. When you have the support you need to find your next vehicle, the car buying process is enjoyable! 56 Auto Sales is located in London, Ohio (a city in Madison County). Our helpful staff is here to help you every step of the way. If you have any questions, please feel free to contact us. Come to find us at 781 State Route 56 SW, London, OH 43140. Contact us at (740) 963-CARS(2277). No Credit? Poor Credit? Foreclosure? Bankruptcy? 56 Auto Sales can help. Let us Get You Approved today with our guaranteed credit approval! Come to 56 Auto Sales today! Our friendly staff will work with you to finance your next vehicle. When you come to 56 Auto Sales, you are guaranteed to be approved no matter if you have good credit, bad credit, or no credit. Our qualified staff is here to help you finance your next vehicle. Numerous factors can affect your credit score. But, your credit score does not directly correlate with poor financial decisions. We at 56 Auto Sales are here to help you finance the car you want. Come in today to be approved your next vehicle. We make the car buying process simple for you. No more traveling from dealership to dealership hoping that you might be approved for a car. We understand that the car buying process can be complicated when you have bad credit or no credit. We are here to help! Located in London, Ohio, we are the car dealership near you that hopes to help you get into your next car. Our vast selection of vehicles for sale are sure to provide you with the options you want to find the vehicle you need. If your car is starting to make noises that you think it should not? Is your old car not running like it used to? Maybe it is time for a tune-up. 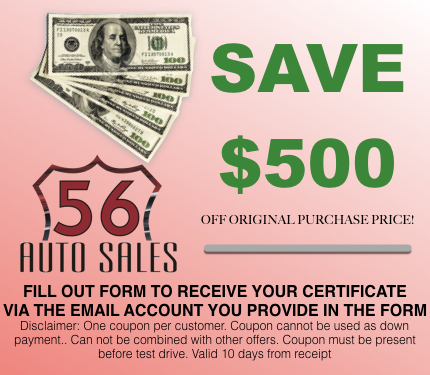 56 Auto Sales is here to help. Our staff is trained to handle maintenance and repairs on your vehicles. We will give your car the expert care it needs to be running at top performance again. No matter your make or model, our trained technicians are here to provide you with the professional car service it needs to run better than ever. Schedule a service appointment today! Our friendly staff will get your car fixed up in no time! If you need car parts, then we are here to help. Fill out our form, and we will get you the parts you need in no time! If you need help trying to figure out what part you need, our friendly staff will help to the best of their ability. We have a vast selection of parts ranging from oil filters to brake pads. When you come to our parts department, we will supply you with the parts you need to keep your car running. Fill out our easy parts order form, and we will get you the parts you need! As a women, I couldn't have asked for a better buying experience and respect while there. Damon went out of his way and I left with a 2014 Nissan Sentra SV. I would recommend. Damon was great very helpfull and pleasure it work with. Made me a good deal . Answered all my questions and very knowledgeable about cars. Thank you so much for your help . Aaron was down to earth, helpful, and not pushy. Even though the truck I went there to see turned out to not work for us, he was willing to keep an eye out for more stock and give us a call back when they got something on the lot that met our needs. Ask for aaron! Went in to look at a bike that was there and he helped me out alot. Understood what i was looking for and also what price range would work for me. Thanks Aaron! I had a great experience working with Damon, he answered all my questions and helped me find a car that is safe for my family and get me to and from work. I will be sending anyone that is looking for a car to 56 auto sales and Damon. Darrell just bought a truck from these folks. Damon was so considerate, paid attention to what he was looking for and never once irritated me, all the while being so patient with my pickiness. Great experience, will definitely go back.